Now available for preorder: Kipon Iberit Z-mount Full Frame lenses! Kipon Iberit 24mm f/2.4 at Amazon and BHphoto. Kipon Iberit 35mm f/2.4 at Amazon and BHphoto. Kipon Iberit 50mm f/2.4 at Amazon and BHphoto. Kipon Iberit 75mm f/2.4 at Amazon and BHphoto. Kipon Iberit 90mm f/2.4 at Amazon and BHphoto. The new Meike 50mm f/1.7 Z-mount lens is now available for preorder at BHphoto. This is the cheapest Z-mount lens you can buy right now! The new Nikon Z6 is in Stock for the first time at BHphoto, BestBuy, Amazon, Adorama, Calumet Germany. WexUk. Jessops. CameraPro. What you find in Stock is mostly the kit version. Body only seems to be out of Stock everywhere. 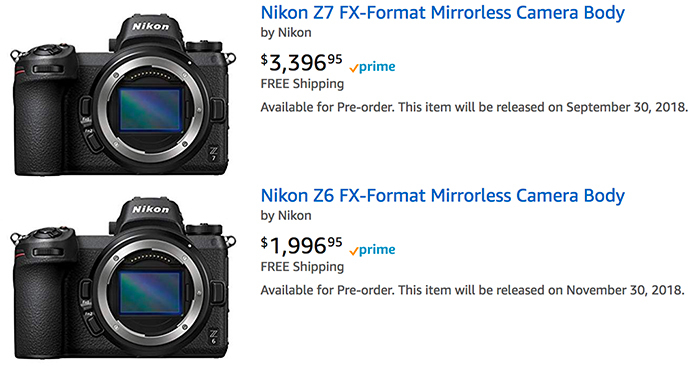 All the new Nikon Z cameras and lenses are now on preorder at Amazon US too (Click here).